You’ve probably had a distracting moment where you had to take your eyes off what you were cooking and when you got back to it—a disaster. Me too. Here’s what I did and it works! We know the manufacturer’s tell us not to use abrasives, scouring powders, steel wool soap pads, brushes, scrubby sponges, so what to do? There is magic in old-fashioned natural cleaning products such as baking soda, vinegar, and old soft toothbrushes. 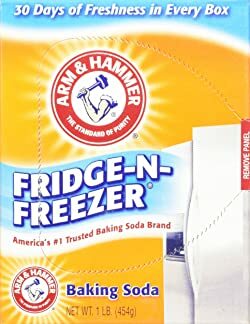 ARM & HAMMER™ Baking Soda has been relieving heartburn, whitening teeth, and removing odors from refrigerators and it’s been around for 165 years. It is safe, eats through grease, and makes teeth sparkle and gums pink. Use two tablespoons of baking soda for each quart of water. Even if you use a little too much, soda it will not hurt the pot. It will do a miracle to burned on foods and grease on ceramic cookware. Use cold water, since you do not need the minerals at the bottom of your hot water tank; add a few teaspoons of baking soda to your saucepan, skillet, pot, or Dutch oven. Baking soda will foam up, so start slowly, and stir with a plastic or wooden spoon. Allow this mixture to slow simmer for a few minutes, remove from the heat, and let cool. Discard the water mixture and wash as usual in dish detergent in warm water, rinse, and towel dry. It should be as good as when new. This works for any browned burned foods be it eggs, sugars, vegetables, meats, and fish. For larger pots and ceramic or porcelain enameled cast iron, use fresh 3% hydrogen peroxide. It bubbles when fresh and loses its strength sitting on a shelf for months and years. It is inexpensive and works well with those tiny bubbles. Pour an ounce or so on the burned on food. Watch it bubble, fill your pot with water, and let it sit. Do not use heat. If needed, use an old soft toothbrush if you need that much aggressive cleaning. Never use hard bristled plastic brushes, dish brushes, floor brushes, or boar bristle brushes. I like to use a wad of gauze for a bit of scrubbing action that is gentle. Peroxide is great for cleaning wood cutting boards too. Enzymes are no longer in laundry detergents, so we use Shout® to remove stubborn stains. Enzymes are good to remove burned on food—they digest it. Spray inside your burned pot, let sit a few minutes, and wash in dish detergent, rinse well, and dry. Distilled clear vinegar and baking soda to the rescue again. You might have to do this several times. Put a quart of water, a fourth cup of clear vinegar and two teaspoons of baking soda into your cookware and simmer. Let the mixture rest and cool, dump out, and wash with dish detergent, rinse well, and dry. In the articles on this site, we have stressed not to use Pam or any cooking oil sprays because of the gummy residue left. Extra virgin olive oil is good for becoming sticky and gummy and so are vegetable oils and Crisco. Too much heat for too long a period will wreak havoc with beautiful ceramic and porcelain coated cookware. Sometimes you cannot force things off ceramic cookware. Sticky carbohydrates such as pasta and rice are some of those things. They can be boiled so dry that not a drop of water is left. When that happens, these food items imprint themselves into the coating. If nothing removes the marks, you might just have to live with it. Whether your burns are caused by gas, electric, ceramic or induction cook stoves, it doesn’t matter—heat is heat and burned food is burned food. We hope you found this helpful and that you are rid of burned on food and stains. You did not say what your pans are made of. This article is about ceramic cookware. Do you mean the inside bottoms or the outside bottoms? If metal bottoms outside, try using Brillo® or SOS® pads. I would need more info to help you such as the brand and the material the pans are made of. You can still get laundry detergent with enzymes, especially ones made for baby diapers. You are right! I had forgotten about that since I no longer have a baby to raise! I appreciate your great comment for readers. As I said above, I use Shout® for the enzymes for stubborn stains on my clothes and for those people who don’t have babies. Maybe baby detergent is cheaper because Shout® is not. I used steel wool on my crock-pot. I now have a black stained crock-pot. Did I just kill my first crock-pot? if not, how do I get it white again? Ohh-oh! First off, you did not tell me what your crock pot is made of and that’s important to know. Did you read your User’s Manual for instructions on how to clean it? That is a must! If it turned black, it is not stainless-steel because steel-wool soapy pads will make it shine. It sounds like it’s ceramic coated and you took the coating off down to the bare base metal. Did you read my tips above for how to clean ceramic and other types of cookware material? It give you all the methods for cleaning. Let me know, but I think you’ve ruined your crock pot.